Weekends are great! I usually don't take both days off, but the sheer feeling of a Saturday is cool. Of all my school days, the ones I surely remember are the half days on Saturdays.. the masti and dhamaal, and the Sunday with a promise of day-long cricket. As we grow up, weekends serve slightly different purposes. Wives settle long-standing (past 5 days') scores with husbands, kids clamour for every bit of your attention, the fishpond suddenly starts looking dirtier, and the joy of playing cricket with your buddies is oh-so-near-yet-so-far as you drive your family around. But I do put my weekends to some good use. I read a lot. Usually too, I do so, but weekends are meant for some serious stretches of reading. I remember a recent Sunday when I started reading stuff at 6 in the morning and ended at 10 in the night, with brief interludes (7 in all) for food and urgent reminders of my humanity. One of the themes I love to seriously read on such Sundays is - The Universe and our place in it. Dr Carl Sagan can take credit for arousing this passion in me while I was young. Having read everything he has written so far (I think), I find his style unmatched, his caliber unbeatable, and his cool quotient truly hot. My mother would look at me suspiciously every time I would ask for 150 or 250 bucks to buy his next hardbound book (that was 1980s)! This blogpost is dedicated to Dr Carl Sagan, who taught me the virtue of being curious about things you can afford not to be curious about. Here goes! The rumblings keep pouring in from all directions. Radiations of all shades, carrying hidden in their core meanings of eons, maybe intelligent meanings. They pierce the upper crust of our atmosphere, striking the lower ranges, and then falling on the surface of this puny planet. Hidden in these radiations are messages from the rest of the universe - most of them natural and unintended, some, maybe not! And for tens of lacs of years, life has gone on oblivious of all this. Creatures of all shades have come, ruled, and gone. The radiations keep coming. They are the message of God's finest creation - the Universe we live in. The Universe is a fantastic thing. We live in it, yet have begun to fathom it only recently. Most of us are least bothered about what it is and what makes it tick, as long as it gives us our daily cuppa without interruption. Some of us do wonder, and then, awestruck - give up! Few of us keep trying and proudly claim that some of its secrets have revealed themselves to us. The basic problem with understanding the Universe is its size. The sheer size relative to the size of a typical life form on Earth is so large, that the entire effort of creating a relationship starts looking unreasonable. If the Universe is the size of a football field, then Earth is maybe a small part of a grain of sand in it. Maybe smaller. This size variation puts a big brake on even a sensible person's effort to understand the Universe. And the modern material man has no incentive to dwell on it any further - none of his bonuses, incentives, growth prospects, or designations depend on fathoming what this horrendous thing called the Universe really is. But interestingly, very recently, huge strides have been made in man's efforts to place himself properly in the whole scheme of things. It looks funny, but is true. Man has actually begun to understand what this whole stuff is made up of really, and how. As they say, from infinity to infinity. From the largest numbers possible (billions of years) to the smallest of dimensions at the atomic level, man's efforts have continued unceased. Just like the larger infinities were experiment by CERN further promises to reveal the smaller infinites to all of us. It is probing the fundamental question - what are protons and similar basic particles made up of. In light of all this technical hullabaloo, one of the most profound questions man has asked is "are we alone in the Universe?" Is intelligent life an aberration? Is Earth alone in this achievement? Are there other life forms capable of asking this question, elsewhere other than Earth? What is their nature? What is their physical structure? Can we ever contact them? The radiations striking Earth every moment - do they carry seeds of our future relations with the other civilisations? Can we send messages to others, similarly? Now imagine you are one of the lifeforms on Earth. Actually the possibility of that is almost 100%, as anyone else reading this would make me quite proud of my writing skills, and popularity of this blog. So, you are one. As you read this and ponder upon this, you start marvelling the nature of life, the twists and turns that it has taken to reach here (i.e. till "you"), and the amazing possibilities that open up if we can somehow find out (and then connect with) lifeforms elsewhere. This logic can be extended one step beyond. If WE sitting here can wonder upon such issues, surely, any other intelligent civilisation(s) that may have evolved to this stage will have individuals who will ponder similarly. Now many of these may be several years ahead of us on the growth phase. Actually, several million years maybe. So, they would not only have pondered, they would have attempted (contacting us, reaching out to us..) and some of them may have travelled all the way (hyperspace and all that). These are very profound questions that boggle the mind once we even attempt asking them. But they are interesting questions. They push the limits of your mind. They force you to move beyond the provincial, the immediate, the parochial.. and think of the basic grain of our existence. I understand that not many young people may find this an interesting prospect, faced as they are with challenges of getting a job and keeping it, but still! For Civil Services prep http://www.pteducation.com/civil.aspxFor CDS prep http://www.pteducation.com/cds.aspx? Dear Sir, Amazing blog. Very truly said, not many young people may find this an interesting topic. I believe this topic is very much related to or I would rather say dependant on spiritual path. I think once a person starts working on god realization he/she automatically finds other materialistic things non-interesting. Person discovers the most superior knowledge of this world and keeps travelling on the spiritual path. “The journey within”. Thanks for the great post.This topic was really a high quality material. Once i got this all questions to my mind-:Is there any other world then this? ?Do they know about our existence? ?If they actually exist are they more advanced and powerful?If they attack on us will this humanity with lots of boundries will come together to fight with them? And if the other world shakes hand with this world,in near future we can see lots of mergers and acquisitions.We will clear then one funda-On this Earth "Its all about money,honey!" i was realy get impressed by your 12 hour uninterrupted reading. How did you get manage it with having the weekend. Fascinating Read. I too enjoy these stuff and though I don't explore it as much as you do, but there is a big learning in all this. As you rightly said the existence of earth within the universe is maybe like a grain of sand kept in a soccer stadium. Similarly every human being on this earth is also akin to a grain of sand kept in the stadium. I offer my gratitude to you for putting up such wonderful topics on blog.This topic brought back some childhood memories-thoughtless questions like whats beyond the sky or how big is our universe.Innocent queries has always kindled curiosity and curiosity inturn has revealed the most arcane truths about universe.Truths which otherwise were far beyond our imagination. Your experiences have always been a grest source of learning and motivation for all of us. i thank you for giving all of us an oppurtunity to share our thoughts and experiences on a single platform.Life now adays has become so intensely occupied with the shades of black and white that we have actually forgotten to experience the beauty of universe around us. I believe nobody would want to miss the chance of enriching their lives with knowledge abound. "To see a world in a grain of sand and a heaven in a wild flower.Hold infinity in a palm of your hand and eternity in an hour"
Khusnud madam - thanks for bringing up William Blake's wonderful words. You have truly added colour to this entire discussion. Please keep reading and commenting. I look forward to more such words of insight from you. Akshay - truly, we all need to be very clear about our place and size in this universe. Nothing at all. Akshay (Kothari) - now let's see. If there are other civilisations in this universe, then what is the probability of that happening? Well, as per Drake's formula, the possibility is high. Here is the complete formula. When all of these variables are multiplied together when come up with N, the number of communicating civilizations in the galaxy. So there are other life forms for sure. REMEMBER, if there are others who are CAPABLE of coming upto Earth, then it is for sure that they will be thousands of years ahead of us on the Technology front. That would mean two things - 1) they will have already surpassed the need to dominate others (a natural consequence of super duper technological development), and 2) they are probably already here, amongst us (there's really no way we will ever know if they are, or are not). I really enjoyed your suggestion of mergers and acquisitions!! Ha ha ... nicely said! Mahesh - thanks for reading and commenting! thank you for motivating me to read his books. I hope that I will be able to read his writings. Thanks for pushing me into that ocean of knowledge.Got a lot of learning from your post and feedback on comment.Topic was very much interesting and detail explaination on that formulae made it more clear. In UTTAR KAND (in RAMAYAN) it is written that there r billions of universe; having billions of earth like our earth & have life like us but in different forms or body types. For example u exists here in Human form here but on another planet ur same identity have different body form, different name etc..If u want more clear detail read UTTAR KAND IN RAMAYAN.. I am a regular reader of your blogs.I like your blog on "Creative Destruction" and "The best advice i got" very much.I have read "The Dragons Of Eden" of Mr. Sagan.I totally agree that his style is unmatched.After reading Dragons Of Eden, i want to read more books writtten by Mr.Sagan but remained unable.Now your blog inspired me again to read Sagan's book. 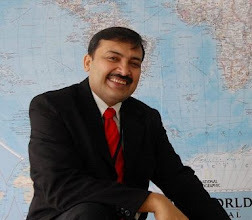 Its really a mind boggling blog Sir, Its very strange that we all are striving very hard to get placements, to make ourselves known to the world, to create something valuable & suddenly we come to know that we are smaller than even sand. Now everything is question mark to me, what to do? Arohan - good to see your comment for the first time. Prof Narlikar remains a great motivating force for many. A class apart indeed. Steven Spielberg's A.I. explored the possibility of future lifeforms truly tantalisingly. In the last part of the movie, we see truly liberated lifeforms that seem to have no material desires at all, sharing everything and anything merely by touch. That was a strong perspective on future. Its very strange when we are striving for a small place in an organization, to get placements, to start something of our own, to to create a difference to the world & we suddenly come to know that we are like a sand & there are lots of creatures like us, a very big question mark to a life? what to do now? I have read Dragons of Eden and Cosmos by Dr. Carl Sagan, and i must say that i was reading those with a mixture of excitement, surprise and utter bewilderment. the way he has captured the basic points of life is beyond praise. He is a true genius and after reading his books, one is left with the hunger of knowing and exploring more and more. moreover there are some awesome videos on YouTube on Hubble Telescope. This was the topic of my interest so would like to thank you for this wonderful blogpost. As I read this blog, the consequences of 2012 came in my mind, and I did some scouting for its authentication and I find that this is a prediction of Maya Calender that says 13 baktuns(5,200 years) is an important reset milestone for earth. But NASA rejected this prediction by saying that it is not meaningful, people are just spreading frightful rumors and gossip. Because prior to this also, they have made such wrong predictions like planetary alignment of May 5, 2000, The "Jupiter Effect" cataclysm predicted for March 10, 1982 etc which never happened. So its time to educate people about this myth and to tell them that, don't take anything as granted. Sonika, Divyangana, Niraj - thanks for reading and commenting. Its great to see you blogging, SM. And ,as always,you are great at what you do! Long time back was a student at PT and I think there is still so much to learn from thee.. This is a topic which fascinates a lot of people(including me). From ancient time we are trying to search what is hidden in the depths of this black avkash. we were so much inspired by the unknown depths of the black avkash that we choose to give our favourite god its name(krishna). paramatma and this universe is all same. u dwell in them, travel in them, observe and examine them, but if u do it indifferently(like a third party, without getting involved in it) it is very difficult way. when u directly connect with them(through the awesome power of mind) all secrets are revealed instantly. thers a person named mr.vartak(i dont remember his first name) in pune who travel all over india giving lectures on adhyatma. this person by yoga methods detached his soul from his body and travelled to mars. and before the nasa started its expidition send a letter to him about what they will find there. when nasa themselves went they found all the claims correct. nasa sent a letter of approval and a certificate to him too!! I privately agree that there are millions of akash gangas like ours and millions of earths like ours. everywhere there might be a Sir Sandeep Manudhane reading books the whole day!! when we get this power of travelling we can even travel in future and past. There came a person in the ashram for help. the ashram people took him without any investigation. he was very good natured, doing all his work earnestly and helping others. shree shree were at that time in london. after a week shree shree called the ashram from london and asked the people there to throw that man out. all were very surprised seeing the good nature of that man, but all the same asked him to go. the next day this very man was arrested by the police for connections with the tamil tigers. he blindly accepted that he was a tamil tiger and that he is proud to be so. maya sanskritis predictions are faulty. there are still 4 lakhs years to end this kaliyuga!! the certificate thing i mentioned above is wrong. I was misinformed by my brother. when i searched net i did not find any such thing. but other things are correct. Mr.Padmakar Vartak certainly claims to have visited mars, jupier, saturn!! Pankajbhai - thanks for reading and commenting. Please stay in touch! Himanshu (T) - good to hear from you! i m posting some video links which is banned by NASA.All video are showing UFOs that are real..
(2)NASA UFO BANNED VIDEO!!! CRAZY!!! As always again a good post. Nandan Ji,Thanks for your comments about ramayan and universe. how did the earth started? ": The story of the present universe starts probably with a big-bang. A point in space with a very vast amount of energy (close to unimaginable) began expanding. All matter contained in the universe (close to unimaginable) formed at that time in a very small fraction of time (close to unimaginable). "what is it according to hindus? ": Hindus do not claim to have the answer to how the universe started. Since the question was asked, the Vedas answered that the universe emerged out of a 'golden egg' (Hiranyagarbha) with great explosion (sphot). That is the closest that scriptures of any religion have described the emergence of universe. For hindu scriptures, creation was not the main question. For them, the main question was preservation and continuation of hindu society. The scriptures should be looked from that angle.